After appearing in two shoots for H&M, Jennie Runk has made buzz by serving as the first plus size model for the fashion brand. The Georgia-born, American model is quite the stunner with her dark hair and crystal blue eyes. At the age of 13, Jennie was discovered by Mother Model Management’s Mary Clarke at a Petsmart in Missouri. Runk later made the decision to gain weight to enter the plus size modeling field, and is now quite the inspiration with her body positive message. 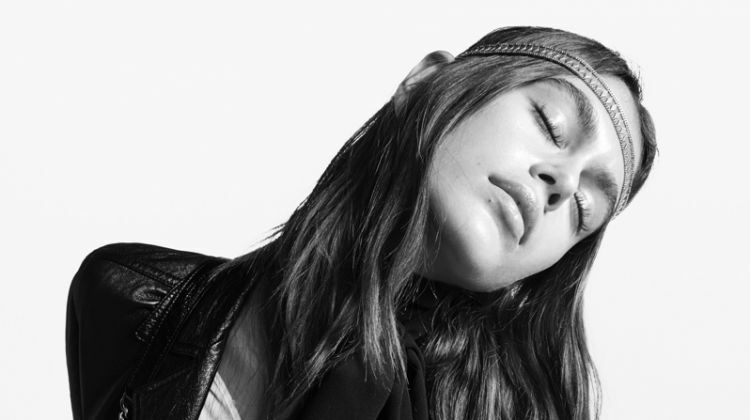 We recently got the chance to ask the model about her thoughts on all the media attention from the H&M images, being a feminist in fashion and her beauty routine. Jennie is currently signed with JAG Models in New York. How do you feel about the term plus size model? Robyn Lawley recently told a magazine that she doesn’t like it. If so, what would be a better term to use? I don’t love or hate it. It’s just what people call me, there’s nothing wrong with it and it doesn’t make me better than anyone else. It’s just a label, like being called tall, female, or brunette. When you modeled for H&M last year, it made a lot of media attention. You even appeared on GMA. How did it feel having all these news outlets write or air features about you? At first it was really strange, because it was so unexpected. Then I saw it as an opportunity to help speak out against body hatred. It’s a serious problem, not only for bigger women, but for skinny women and even men, too. There’s no reason any person should feel like they’re worth less than they really are because of something as variable and superficial as their body type. A person is so much more than the body they live in, everyone should know that. It seems as if the shape of fashion is changing with major brands starting to use more curvier girls. Do you see models like yourself becoming more common in the next ten years? I have definitely noticed a wider variety of models being used in mainstream fashion. I don’t think we should focus solely on using more curvier models, though. I think we should use more of every body type in fashion, media, and advertising. I hope someday every young girl can look through her favorite magazine and see someone she can realistically identify with. I read in an interview with ELLE that you consider yourself a feminist. What does that word mean to you, and is it hard being in fashion and having feminist beliefs? For a long time, it was a struggle for me to be in the industry that gets blamed so much for keeping feminism at a stand-still. Then I realized I can use my notoriety to promote healthy body image and inspire young girls to reach for their full potential. If not for my career, I would never have gotten the opportunity to speak out and be heard the way I can now. I think it’s important for the message to come from this industry that holds all the power over what’s considered beautiful, or cool. It’s beautiful to be happy and healthy, and it’s cool to be accepting of others, especially when they’re different from yourself. Great interview, she sounds like a smart girl!